Why conduct a Happiness Initiative? 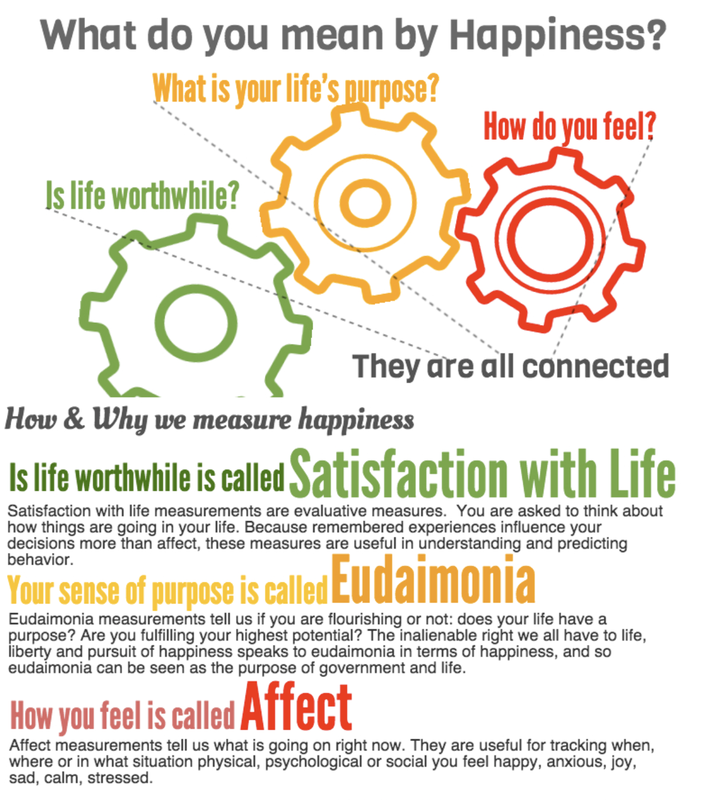 To give people an way to measure happiness. To raise awareness about what really matters in life. To change the conversation about how we define happiness. To expand the dialogue about the purpose of government. To provide policy makers an experience of wider measures of well-being. To be a leader in the happiness movement in your town, in your community, in your company. *a concise report about a complex issue written to help readers understand an issue, solve a problem, and make a decision. What is the purpose of your Happiness Initiative? What is your model for engaging in your community, city, campus or company? The paper Happiness In Communities gives examples of models of engagement. Over 200 uses of the Happiness Index by cities, communities, companies and campuses since 2011. See projects on the Happiness Map. What really inspires you to conduct your Happiness Initiative? What gives you energy & a sense of purpose for your Happiness Initiative? Gather support. Experiment with raising awareness and expanding the conversation about what really matters in life. Gather advice and ideas for realizing your Happiness Initiative purpose. Friends, Family, Colleagues...people in your life. With your purpose in mind, what people and organizations will be helpful or necessary to realize the purpose of your Happiness Initiative? Once you convene your dream team, be open to adapting your purpose to the circumstances of your community, city, campus or company. In your city, town or region, dream teams may representatives from local and regional governments (the mayor, city manager, council members, planning department, etc. ), chamber of commerce, health authority, foundation, media, parks department, libraries, university and colleges, nonprofits and other organizations. In your community, dream teams may include your neighbors, neighborhood councils, like-minded enthusiasts, or team members. On your campus, dream teams may include the campus president, professors and faculty, students, and university press. In your classroom, dream teams may include a professor and students. In your company, dream teams may include the C-level suite, managers from cross departments or within a department, and enthusiastic employees. On a project or for a team, dream teams may include the project manager and team members. A big part of your connecting will be raising awareness and educating people about the happiness movement. Be ready to share what you have learned and to keep learning as you share. Do you have a plan and you feel good about your plan? Do you feel like you have enough support to do what needs to be done? Give people direct access to understanding and assessing their own happiness and well-being. Raise awareness about what happiness is and how important it is. ​Gather data in your city, campus, company or community. Expand the conversation about the purpose of life and the purpose of government. Use your the happiness index scores in your community, city, campus or company. ​Donations come with one hour of consultation. You are ready to gather happiness data for your group (population). You have an idea of how you will use your data. Have a plan for launching the Happiness Index for your Happiness Initiative. Start small. Ask your friends, family and colleagues to take the survey first. Then gather the data and have a conversation with them to explore ways to use the data. Learn from your small start. Convene your dream team and have them take the survey. Gather the data again, and have anther conversation with them about how to use it. Create a plan with your dream team to launch the survey for your area. Involve the media. If someone from the media or with good media connections is on your dream team, then they can help engage the media early in your Happiness Initiative project, so that when you launch your Happiness Index, the media will be primed. Let people know you are gathering data over a certain time frame, but allow people to take the survey after that time frame. You can gather data on a continual basis, but people generally prefer deadlines. Let people know how the data will be reported and used, and how they can get informed and involved. Random sampling is a "sampling method in which all members of a group (population or universe) have an equal and independent chance of being selected" (businessdictionary.com). Random sampling gives you data that represents your population. This is especially important for policy makers who want to use the data to make decisions. Random sampling can be done by telephone, online, mail ballots, in-person interviews and other means. Random sampling can be expensive. You usually hire a pollster to conduct a random sampling. Some Happiness Initiatives have involved a university class conducting a random sampling as part of the coursework (i.e. classes on random sampling). Convenience sampling is a sampling of people who choose to take the survey. Depending on the size of the population, you need almost everyone in your population to take your survey through a convenience sampling to be sure it is representative OR you can "ground truth" by comparing the data you collected with your convenience sampling to data for the same or very similar question collected through a random sampling. Convenience sampling may or may not represent your population. You would need to ground truth it to see if it did, but even then, it is very important you are clear when communicating about your data that it was collected through a convenience sampling. Data collected from a convenience sample does not mean it is not valid. The data does reflect the state of the people who took the survey. Convenience sampling of even very small samples can always be used to raise awareness and expand the conversation about the purpose of life and purpose of government. You have a plan that feels right to you. You have a plan that to which others on your dream team agree. You have the resources and ability to fulfill the plan. (Scale down if you need to, and start smaller). See examples with our Happiness Report Cards on our homepage. Use your averages for the domains of happiness first. Look at the data for domains and specific questions different aspects of demographics. Are youth unhappier than the general population in some areas? Which areas are people with low incomes suffering in more or less than other? You may decide to add questions so you can see how immigrants are doing compared to non-immigrants, etc. Work with your friends, family and colleagues or your dream team to analyse the results and figure out the stories the data tells. Engage with you community to get feedback on the data through town halls, world café style meetings, online forums, etc. Create a beautiful report, even if it is a small part of a larger analytical report. Learn how to analyze your Happiness Index data. *email info@happycounts.org with the name and location of your Happiness Initiative, your website, and a short description. You have analyzed your data. You can clearly communicate about the nature of your sample (convenience or random). You feel confident about the story your data tells. Happiness Initiative Leadership Trainings provides the knowledge skills and tools for taking leadership in the happiness movement and impart actionable information and resources for true leadership. The Happiness Alliance gave its first ​Happiness Initiative Leadership Trainings in 2012 to inspire and empower community organizers, activists, academics, and policy makers and have seen the power of these trainings. ​Happiness Initiative Leadership Trainings impart the knowledge and skills for joining the happiness movement. We cover two core topics and supplementary topics as meets the goals and circumstances of your cohort. We emphasize learning about the happiness movement, including the successes and lessons gathered over the years, sharing from the experience and expertise brought to the group by participants, and building ongoing community. Trainings draw from working in communities since 2010 with governments in cities and community organizers and researchers internationally; participation in the 2012 UN High Level Meeting Well-being and Happiness: Defining a New Economic Paradigm civil society working group; 2015 OECD 5th World Forum Statistics, Knowledge and Policy: Transforming Governments, Changing Lives; 2017 and 2018 Dialogue for Global Happiness at World Government Summit; and 2017 World Happiness Summit H-20 Government track, and other important happiness movement summits where Happiness Initiative Leadership Training instructors have been invited participants and presenters. Who, What, Why and Where: the Global Happiness and Wellbeing Movement. This session will cover the science, policy and civic actions behind the happiness movement. We will review activities at the governmental level in Bhutan, the UK, Brazil and France. We will delve into the science that supports this movement, and provide resources for the participants use. The importance and need for subjective metrics will be explored. We will then survey the various NGOs in the EU and the US active in the happiness/beyond GDP movement. We will finish with discussions about communicate to various audiences including those who not aware of the movement, those who are resistant to social change as well as scientists, policy makers and the media. How to Conduct a Happiness Initiative: the nuts and bolts We will go over the logistics of conducting a happiness initiative. This includes team building, timelines, subjective metrics, including the need for subjective metrics, and review of wellbeing surveys, objective indicators, happiness report card writing and levels of data analysis, conducting outreach to immigrant and refugee and other underserved peoples, conducting town meetings, projects and policy changes & final comprehensive report writing.The session will end with an exploration of the next steps for the happiness movement as called forth by experts, academics and grassroots activists in the happiness movement and how to make an impact. Giving a Happiness Talks: a lesson in action. A lesson on how to give a happiness talk patterned after the talk that has been presented to many companies, non-profits and campuses. The aim of this talk will be for participants to walk away able to give a happiness talk to various audiences, from the curious to experts. We will give pointers at critical junctures and discuss the session in a group setting. We will explore the link between personal happiness and social change and how to communicate as well as integrate the two area in a happiness initiative. This is a highly interactive session. Participants will have a chance to learn about the happiness movement, the Happiness Index and gain tips on how to give talks and presentations. Raising Awareness: tips, tools and best practices for raising awareness about the importance of happiness, the role of happiness in society and life and happiness policy. We will go through examples of successful projects and programs conducted in neighborhoods and cities across the US and elsewhere. An overview of the risks and means for managing them with simulated examples will conclude the session. 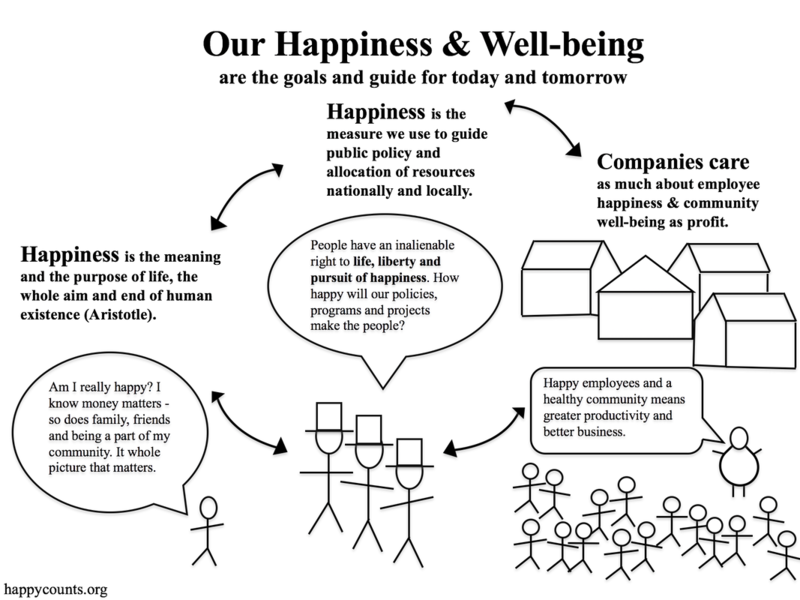 Personal Happiness: How does the field of positive psychology fit to the work for a new economic paradigm. We will explore the nexus and disjoint between individual happiness and social change. Tools and resources for presenting and communicating with various audiences from children, youth or economically disadvantaged people will be provided and reviewed. We will conclude the session with a synopsis of the key leverage points for the happiness movement. ​Happiness Policies: What is a happiness policy screening tool, who is using it, and how can you use it? In this session we learn about how to screen policies and programs using a happiness screening tool based on Bhutan's GNH policy and program screening tools. We then explore what happiness policy looks like and could look like in an open appreciative inquiry process setting. The session concludes with an exercise using the policy screening tool. Email info@happycounts.org for bringing the Happiness Initiative Leadership Training to your government, organization, campus or community. Sign up for the the Happiness Alliance Newsletter & get news of Happiness Initiative Leadership trainings and Happiness Data Reports. Still want more tools for community action? & for everybody pre-order our book The Happiness Policy Handbook.